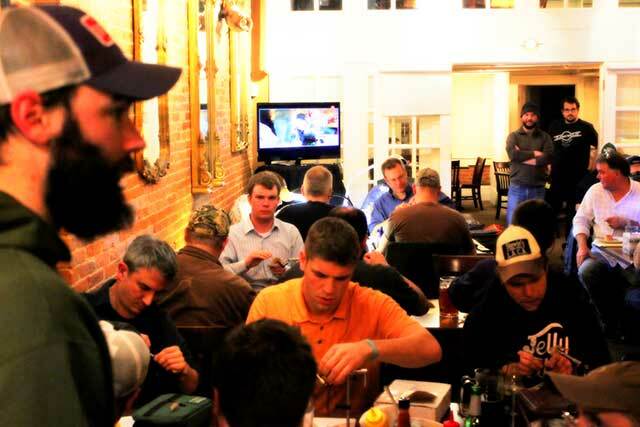 The tying legion at the Schultz Outfitters Bar Fly Event. They shuffle in through the dual 8 foot wooden doors in twos, threes and single file, in a haste to escape the arctic temps, the barrage of snow, and the face-stinging winds that have become signature to the fittingly coined “Polar Vortex” of 2014. Work boots trample slush over rubber mats and dress shoes scuff the welcome runner as the rushing 7 o’clock Amtrak passes by shaking Sidetrack’s Bar and Grill in Ypsilanti’s Depot Town. January in Michigan. It’s cold and we’re buried. It’s funny how words like ‘hex’ and ‘hatch,’ ‘rod’ and ‘reel,’ or ‘micro’ and ‘brew’ for that matter, complement each other so well. And at this point, I’m pretty confident ‘polar’ and its more sinister half, ‘vortex,’ don’t. Combining the two is enough to invoke images of giant white bears and tuxedoed penguins spiraling haplessly into a dark abyss of frigid demise. And perhaps the only difference between us and them right now are the extra layers of insulation they’ve put on from the millions of evolutionary years spent in natural selection and the fact that Michigan, since the last Ice Age anyway, has always been a little farther than a stone’s throw away from the North Pole, seemingly far enough not to share the same climate. But apparently Jack Frost missed the memo. So for now we stay inside, waiting for a break, and tie flies. Some of the tying faithful look as if they’ve driven here straight from work carrying leather brief cases and black messenger bags. They’ve come as understudies to sit with some of best fishermen and tiers in the state. And if it wasn’t for the hoodies, flannels, and logo hats mixed among slacks and dress coats, one might suppose a happy hour “business meeting” is in order. But instead of power adapters, market forecasts, and laptops, vises are clamped to the sides of tables pre-smothered in fur, feathers, and spools of thread. It’s 7:15 Wednesday night and Schultz Outfitters’ Bar Flies 2014 season is in full swing. Death, taxes, and traffic aside, there are few givens in life. But just for fun let’s throw in Mickey Rourke’s acting, Bukowski’s writing, and the fishing of Tommy Lynch—who from what I’ve heard is now in the final stages of a complete metamorphosis into a 36-inch hook-jawed male brown trout. Incidentally, all three participated in at least one Bar Fly event circa 1987, with Lynch spawning some of the latest and arguably most prominent advances in over a decade to a streamer movement approaching revolution. Tommy Lynch, spinning for gold. Lynch’s Bar Flies tie for the night is a mean slab of bug meat meant for the cruelest of carnivorous fish. It’s called the D & D, the Double D, or Triple D depending on the number of articulations you give it—otherwise known as the Drunk & Disorderly. (That many Ds in succession should get the blood flowing and if not, a mistyped Google entry most certainly will.) 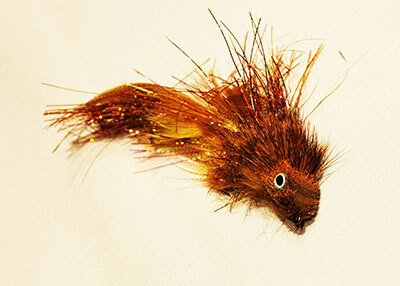 A modern day twist to Rumpelstiltskin, Lynch spins his thread for gold, enticing massive golden brown trout—en masse —to the stripped fly. The D & D is after the donkey not the dandy, it’s the Diesel to your Durango. Did I mention it also doubles as a musky fly? Forget the jerk-strip rise and fall action of typical lead-eye streamers. The D & D’s elongated, sloping wedge head dives deep on the strip, kicks out left to right and back again then recovers vertically without leaving “the zone” too quickly. Think Rapala or crankbait as opposed to Zoo Cougar. And yes it’s got the rattle too. Halfway into the session and Lynch already has three offers to buy the fly sitting in his vise. A streamer collector’s rookie card? Memento? Or maybe a benchmark that sets the bar for future ties? Whatever the reason, it’s a hot commodity at Bar Flies, with rising stock and a sticker price to match. This one’s not for sale though, and after I grab it for a quick photo-op Lynch secures it in his box with twenty or so other battle-ready recruits, same size but in a myriad of colors. Tying the D & D is cool but no cakewalk. There’s the Wire Bite, the beads, the strategically rear-tapering wraps of rabbit strips. Fly rattles, Holo Flash, Mallard Flanks and more bunny. In fact, there’s probably enough rabbit and deer on it to put out an APB on Bambi and Thumper. Plus, one wrong move trimming the wedge head and you might as well start it over. Oval eyes attached with a heavy dose of Clear Cure Goo and UV burn later and it’s time to wrap things up. There’s a buzz in the room and a feeling that we’re entering a new frontier. A small group gathers around Lynch’s table. As things wind down, I reflect on the wealth of information transmitted through the crowded room. I take a quick stroll around to peek at the other D & D prototypes—their proud new owners looking on in high hopes of the next two-foot brown to engulf Lynch’s mad creation. And yes, there is a certain level of madness to it. After all, it’s only fly fishing. Just a fish eating a fly…right? Well, sort of. That is, unless you’ve ever witnessed the denizens that chase these bugs out of the shadows firsthand. 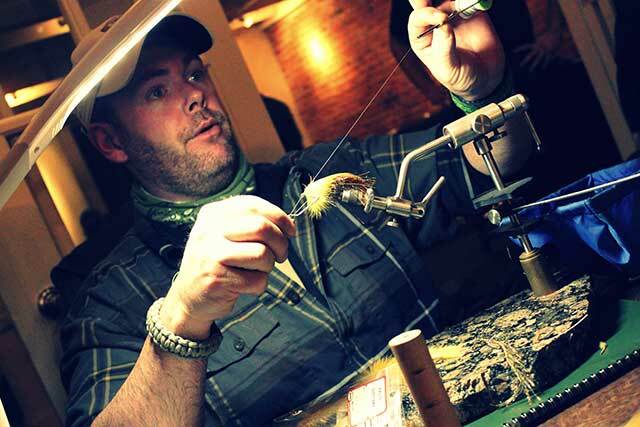 To delve into one’s craft deep enough to truly bring something new, especially in a sport as over-saturated as fly fishing, means there must be another gear, a shift into overdrive where passion transcends the status quo. Innovation must also inspire. The best university professors I can remember worked in offices that appeared, at least superficially, to be in complete disarray. But rest assured, the precise location of every single most scholarly work was well known and at barely an arm’s length. One prof in particular never used PowerPoint and would instead give two-hour lectures verbatim from the text on memory alone. His was the only course considered a “mandatory elective” for all majors on campus. For the inventor, there is method within what appears to be irrationality, and it repeatedly blocks out what is external to his work. The intent here is not to exaggerate but to build on the phenomena that goes beyond mere sport. Those dedicated to their professions recognize this type of “insanity” and fully embrace it. In “Betting on the Muse”, Bukowski wrote, “Some people never go crazy. What truly horrible lives they must lead.” A bruised and battered Mickey Rourke repeated the same words in “Barfly” in 1987. Fortunately for us, from Lynch to Supinski, to Senyo and others, Schultz Outfitters’ Bar Flies Series has a solid line-up of the most current and relevant R & D available now through March in Depot Town. 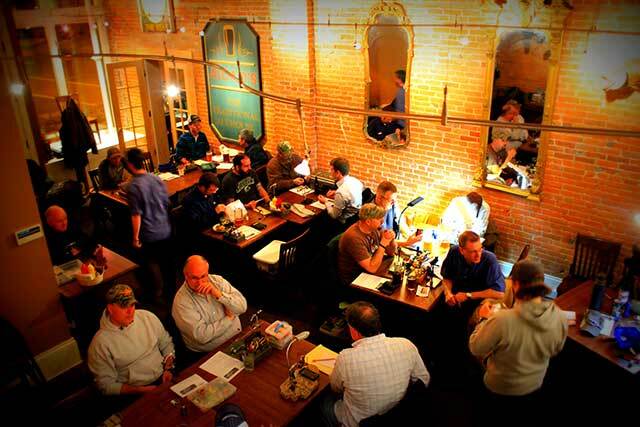 An evolution in fly tying is underway, and luckily I’ve got a front row seat.